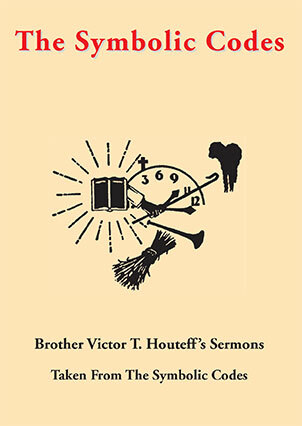 From time to time, as the Lord directs, it will be the privilege of The Symbolic Code to publish certain sermons delivered by the late Brother V.T. Houteff through the years before the Timely Greetings series was started. These sermons will be judiciously selected on the basis of their current application to our present needs, from the most complete collection of existing notes on his addresses since 1929. These discourses should prove just as encouraging and helpful and perhaps even more timely in view of the closing phase of the work for the church than they were when they were delivered. shared the popular expectation of an earthly kingdom. They could not comprehend the movements of Jesus. Already they had been perplexed and troubled that He made no effort to strengthen His cause by securing the support of the priests and rabbis, that He did nothing to establish His authority as an earthly king. A great work was yet to be accomplished for these disciples before they would be prepared for the sacred trust that would be theirs when Jesus should ascend to heaven. Yet they had responded to the love of Christ, and though slow of heart to believe, Jesus saw in them those whom He could train and discipline for His great work. And now that they had been long enough with Him to establish, in a measure, their faith in the divine character of His mission, and the people also had received evidence of His power which they could not question, the way was prepared for an avowal of the principles of His kingdom that would help them to comprehend its true nature." -- Mount of Blessing, pp. 11, 12. From this reading we can see what the Christian does before his conversion, and this afternoon we are to study further what the Christian does after his conversion. received the spies with peace." This is what faith wrought in the instances we just read about, but something else must also be needed besides faith. Num. 13:20 -- "...And be ye of good courage, and bring of the fruit of the land. Now the time was the time of the firstripe grapes." befell them: and they said unto Joshua, Truly the Lord hath delivered into our hands all the land; for even all the inhabitants of the country do faint because of us." Josh. 2:8-11 -- "And before they were laid down, she came up unto them upon the roof; and she said unto the men, I know that the Lord hath given you the land, and that your terror is fallen upon us, and that all the inhabitants of the land faint because of you. For we have heard how the Lord dried up the water of the Red Sea for you, when ye came out of Egypt; and what ye did unto the two kings of the Amorites, that were on the other side Jordan, Sihon and Og, whom ye utterly destroyed. And as soon as we had heard these things, our hearts did melt, neither did there remain any more courage in any man, because of you: for the Lord your God, He is God in heaven above, and in earth beneath." Yes, the inhabitants of Jericho all lost courage -- and that was the beginning of their defeat. In order for Christians to be victorious they must possess (1) faith -- Hebrews 11; (2) courage -- Joshua 2; (3) action -- Exodus 14. Ex.14:11-16 -- "And they said unto Moses, Because there were no graves in Egypt, hast thou taken us away to die in the wilderness? wherefore hast thou dealt thus with us, to carry us forth out of Egypt? Is not this the word that we did tell thee in Egypt, saying, Let us alone, that we may serve the Egyptians? For it had been better for us to serve the Egyptians, than that we should die in the wilderness. "And Moses said unto the people, Fear ye not, stand still, and see the salvation of the Lord, which He will shew to you to day: for the Egyptians whom ye have seen to day, ye shall see them again no more for ever. The Lord shall fight for you, and ye shall hold your peace. forward: But lift thou up thy rod, and stretch out thine hand over the sea, and divide it: and the children of Israel shall go on dry ground through the midst of the sea." Here we see a picture of all Israel with no courage just at a time when they so much needed it. To solve their problem did God command them to sit down and pray? -- No, the command was that they go forward, that Moses first lift his rod and stretch forth his hand to divide the sea, and that the multitude go on through. To all human reasoning this command would seem utterly foolish in the face of their predicament, but God knew all about it. He knew what He was doing when He led them there, too. He was about to bring to pass so great an event that it would bring fear upon the heathen and thus help make possible God's people taking the land of their promise, as well as to relieve them of the pursuing Egyptians. This lesson shows that unfailing faith, courage, and action is the cooperation that is required from the converted Christian every advance step of the way in God's leading, and it always brings success. of the Devil to bring defeat to God's people if they allow it. In the days of King Belshazzar there was a war in which the Medes and Persians wanted to break through the walls of Babylon and subdue her under their rule. You recall that the Babylonians suddenly lost out because they were over-confident. Yes, they had placed all their confidence in their strong walls! To bring this lesson down to our time we find from Holy Writ that the cause of the Laodiceans' downfall is due to the operation of the same principle that brought Babylon's defeat -- over-confidence. Yes, they say they are rich in Truth and have need of no more although God says that they are "wretched, and miserable, and poor, and blind, and naked." Thus they have fallen into the Devil's trap for them. In warfare you know that each side tries to confuse its enemy and break their morale with the end in view of weakening the enemy and thus making its own victory easier. And when they plan their attacks and invasions they attempt to make them in the places they think their enemy would least suspect. opportunity to break down their courage and morale and thus make sure to accomplish their defeat as we saw demonstrated in the examples we have cited today. And do not think for a moment that he is not looking for the vulnerable point in us, too, that he might strike and cause our defeat. We could expect his assault upon us to come from the place we least expect it. So, unless we know what our weakest spot is how could we know where the Devil is going to attack us? The Enemy made Laodiceans believe they have no need of more Truth, that they have all Truth that is necessary to get them through Heaven's portals, although God has declared that they are in need of everything, and are about to be "spued out" (Rev. 3:16). not spawn courage in anyone, but they rather would bring nothing but discouragement. For anybody to come to a meeting and manifest discouragement, it is a sure sign of his own personal spiritual bankruptcy, his personal defeat. And what kind of daily testimony do you give in your associations with others by word or by pen? There is only one road, but it has two sides to it: On one side are the Laodiceans saying, Fear not, everything is all right. I saw some Davidians last night on the other side of the road discouraged with everything. Neither is right. Neither is trusting in God. 1 Tim. 3:7, 8 -- "Moreover he must have a good report of them which are without; lest he fall into reproach and the snare of the Devil. Likewise must the deacons be grave, not doubletongued,..."
Jas 2:17-20 -- "Even so faith, if it hath not works, is dead, being alone. Yea, a man may say, Thou hast faith, and I have works: shew me thy faith without thy works, and I will shew thee my faith by my works. Thou believest that there is one God; thou doest well: the devils also believe, and tremble. But wilt thou know, O vain man, that faith without works is dead?" The only way we can show our faith to others is by our deeds, our works. What does it mean to confess our faults one to another? -- We do that when we make our faults right with those whom we have wrongly influenced. But last night this is not what we heard in some of the testimonies that were spoken. The converted Christian always has a good report; he is a man of faith, courage, and works; he is a Davidian indeed. him by the blood of the Lamb, and by the word of their testimony; and they loved not their lives unto the death." It is for us to go through with these who shall be given sure and complete victory over the Evil One. Let none, therefore, fall into the snare he has set for us.